In February 1912 thirty-eight American Jewish women met at Temple Emanuel in New York and founded Hadassah, the Women's Zionist Organization of America. This has become the largest Zionist organization in the Diaspora and the largest and most active Jewish women's organization ever. Its history is an inseparable part of the history of American Jewry and of the State of Israel, and the relationship between them. Hadassah is also part of the history of Jewish women in the United States and in the modern world more broadly. Its achievements are not only those of Zionism but, crucially, of women, and throughout this study Mira Katzburg-Yungman pays particular attention to the life stories of the individual women who played a role in them. Based on historical documentation collected in the United States and Israel and on broad research, the book covers many aspects of the history of Hadassah and analyses significant aspects of the fascinating story of the organization. A wide-ranging introductory section describes the contexts and challenges of Hadassah's history from its founding to the birth of the State of Israel. Subsequent sections explore in turn the organization's ideology and its activity on the American scene after Israeli statehood; its political and ideological role in the World Zionist Organization; and its involvement in the new State of Israel in the twin fields of activity: in medicine and health care and in its work with children and young people. 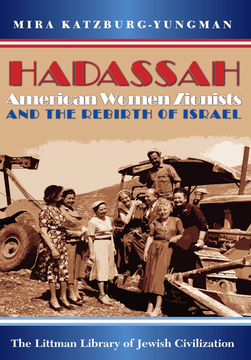 The final part of the book deals with topics that enrich our understanding of Hadassah in additional dimensions, such as gender issues, comparisons of Hadassah with other Zionist organizations, and the importance of people of the Yishuv and later of Israelis in Hadassah's activities. The study concludes with an Epilogue that considers developments up to 2005, assessing whether the conclusions reached with regard to Hadassah as an organization remain valid. It considers developments within Hadassah in the 1980s and 1990s, years in which the organization was affected by the significant changes within the wider American Jewish community, specifically the enormous increase in intermarriage with non-Jews and the impact of the so-called 'second wave' of feminism. Mira Katzburg-Yungman, who received her doctorate from the Hebrew University of Jerusalem, is a scholar of American Zionist history, specializing in the history of Jewish women. She has published prolifically on these subjects, particularly on the history of Zionism and of American Jewry more widely. It is her deep knowledge in these areas that has allowed her to write a history of Hadassah that portrays the organization in its proper context. She has developed the field of American Jewish history at the Open University of Israel for many years and has made a particular contribution to the subject with the three-volume collection of documents and articles, The American Jewish Experience, which she compiled and edited and which is a widely acclaimed sourcebook used in universities and colleges throughout Israel.